You can use frozen prawns if you are unable to get hold of fresh ones – they are perfectly all right if you defrost them thoroughly. First of all pull off the heads and legs with your fingers, then simply peel away the shells, which come away very easily, but leave the tails attached, as this makes them look prettier. 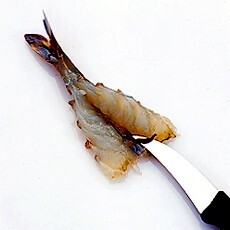 To butterfly the prawns, turn each one on its back and, with the point of a sharp knife, make a cut down the centre of each prawn, but do not cut through. Ease open with your thumb like a book and remove the brownish-black thread, scraping it away with the point of the knife – it should also come away easily. 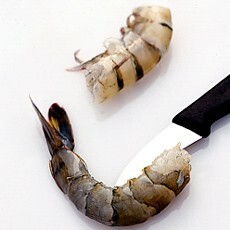 Next rinse the prawns and pat them dry with kitchen paper. They are then ready to use.